Features/ Weak Points/ CL & CLE Lenses/ TTL Flash/ Flash Adventures/ Repairs /Gold /More Info? 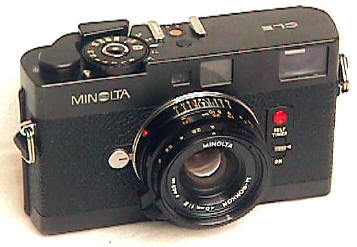 The Minolta CLE was introduced 1980. Yet, father Leitz makes haste very slowly. Until the introduction of the Leica M7 in 2001, the CLE remained for 21 years the most technologically advanced Leica M mount camera ever produced. Not bad, for a Minolta. Most CLE owners consider it one of the best cameras they have ever owned. Compact like the older CL, the CLE (electronic) boasts a list of impressive new features. Instead of the 40/90 combo for the CL, the CLE uses a more useful set of 28/2.8, 40/2 and 90/4 multi coated Rokkors. They use Leica's traditional parallel focusing cams for complete focusing compatibility with the rest of the M system. The rangefinder is longer and with a brighter RF focusing spot. For the first time, the CLE offers TTL flash off the film plane with its small CLE Flash. Also for the first time, it offers aperture priority exposure as well as manual exposure. The CLE's electronic shutter is the 1st built into an M mount camera. The CLE was an expensive quality camera with an admittedly limited market from the start. Research at this time indicates a production of only about 34,000 cameras. I'm guessing the starting serial # was 1000001. The recorded low is 1001001. The recorded high serial number I have recorded so far is 1033618. The CLE's 40/2 Minolta M-Rokkor is very sharp, certainly comparable to Leica optics. This pic shows the on/off switch. The CLE turns itself off after about 20 seconds, and can be re-activated by just the touch of your finger on the shutter release. Neutral position is OFF. Pushed down, the camera is on. Pushed UP activates the self timer with its blinking red light. The CLE's metering system is very sophisticated for its time and for a rangefinder. A Silicon cell in the bottom of the film chamber reads the approximate exposure off the patterned shutter curtain. Actual exposure is set DURING the exposure by metering off the film!! The CLE's rewind is on the bottom of the camera, like the CL and the M5 before it. The bottom battery compartment holds D76 cells, along side of the battery check and the rewind button. One of the few M mount cameras with TTL metering(M5,CL,CLE,M6) . The metering range is EV 3 to 18, which translates to 1/2 second at f/2 to 1/1000 at f/16 using ASA 100 film. The manually set ASA range is an ample 25 to 1600, with a plus/minus 2 EV range effectively extending it even beyond that. A silicon metering cell reads a centerweighted, bottom biased, reading OFF THE FILM during exposure. The 1st M mount camera which uses an electronic remote shutter release. If you want the ultimate in vibrationless photography, this may be it. Frameline NOTE: While the CLE has automatic built in framelines for the 28, 40, and 90 Rokkors, there is not complete frameline compatibility with the other M cameras. The 28 frameline is visible at all times. The 40 and 90 framelines appear or disappear according to mounted lens. The CLE 28 brings up the 35/135 framelines on the M6 via mechanical linkage. The frame line lug on the CLE lens can be modified by a repairman to bring up the proper 28 on the M6----but of course then it would bring up the 90 on the CLE! A Leica 35/135 brings up the 28 frameline by itself on the CLE. The CLE 40 lens brings up the 50/75 frameline on your M6. A Leica 50/75 brings up the 28/40 combination on your CLE. . The CLE 90 lens brings up the 90/28 frameline on your M6. A Leica 28/90 lens brings up the 28/90 combination on the CLE. One solution to the CLE's different framelines is using modern Cosina Voigtlander Leica screw mount lenses, with the adapter that brings up the frameline of your choice. 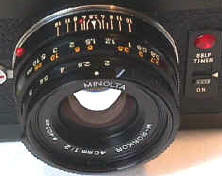 The 28mm Minolta Rokkor lens which often exhibits "spots" at the edge of its elements from poor edge coating. The bigger the spots, the more likely you will see flare or other problems in your pics. This is a well known defect. At one time Minolta USA repaired such spotted 28 Rokkors free of charge. CLE Repairs are no longer available from Minolta USA because there is NO Minolta USA. Minolta is sadly out of business, bought out by Konica who in turn also sold out of the camera business to Sony. 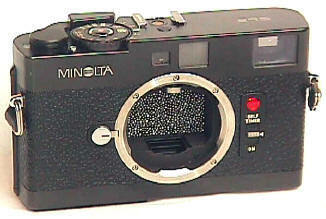 The CLE shutter, meter readout, and shutter release are based upon Minolta's XG series. Keep in mind not a lot of CLE's were made. Your local independent repairman may say they can't work on them simply because they never have before. Ask them if they can repair Egg's. IF they can, they can probably repair the CLE too! Keeping a few XG parts bodies is a wise decision. The biggest problem long term is the lack of replacement CLE circuit boards. Like any other electronic camera, the CLE is sensitive to dust and dirt inside the cover. Dirt can give you erratic meter readouts or other problems, a common and easily curable CLE repair. What's the difference between Minolta CL and CLE Lenses? Two focal lengths were made for the CL: 40/2 and 90/4. Three focal lengths were made for the CLE: 28/2.8, 40/2, and 90/4. CLE lenses are multi-coated, CL lenses are not. CLE lenses have traditional Leitz parallel focusing cams, CL 40/2 and 90/4 lenses have very angular focusing cams. No one questions the CLE lenses will work well with the Leica M cameras. Some people believe the CL lenses are not 100% compatible with the M's -- I disagree, the full story is in the CL profile. The easiest way to spot CLE lenses is their serial numbers are on the lens barrel. CL lens serial numbers are on the filter ring. The 40/2 lenses for the CL or CLE are among the sharpest lenses I have ever used. 28/2.8 Multi-Coated Rokkor, 7 elements in 5 groups, 4 3/4 oz, special bayonet metal shade. Many of these lenses are prone to develop white spots around the outside edges of the front lens elements. Minolta realized the problem and repaired it no charge for a long time...though I don't think they are still doing it. If the spots are small there will probably be no noticeable effect, though if the problem has progressed you can get a ghosting effect. While sharp, it is not as good as the much more expensive Leica 28/2.8's. If it has white spots, my advise is NOT to buy it. Either the Voigtlander 28/1.9 or 28/3.5 will likely have better performance than the two decades older Minolta 28/2.8. 90/4 Multi-Coated Rokkor, 4 elements, 8 13/16 oz, collapsible rubber shade. The optical formula is slightly different and improved from the CL's 90/4 -- though the difference is a small one. Collapsible Lenses. Be careful! Don't force the lens into the body, or you may damage the lens AND your camera. 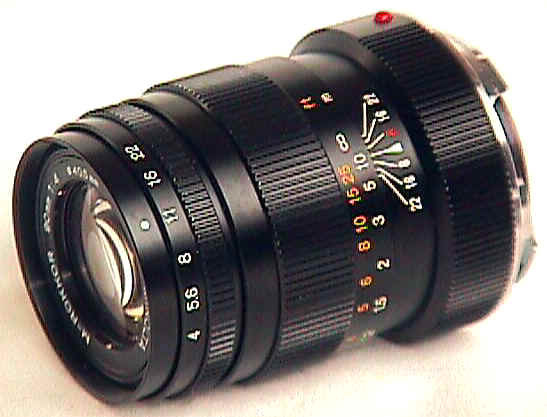 The 35/1.4 Summilux will not mount due to a protective ring for the rear element. Remove the ring and you can use the lens--but be careful. I am not sure about the later 35/2 and 35/1.4 ASPH Leica lenses. Some versions of 35/2 Summicrons have a similar protective ring which makes mounting the lens difficult. Likewise, this ring can also be removed. IMPORTANT: Unmodified, these two lenses MAY damage the CLE's rangefinder cam if they are mounted when not set at their closest focus. If you have no other lenses available and it's a close up shot, you can use them in their closer focusing range only, but be careful and don't focus beyond about 9/10 feet! The CLE's rangefinder baselength is not long enough to consistently focus 135 lenses wide up and close up, but if you shoot at medium and smaller apertures, and from about 30 feet to infinity, you will probably have no problems with accurate focus. 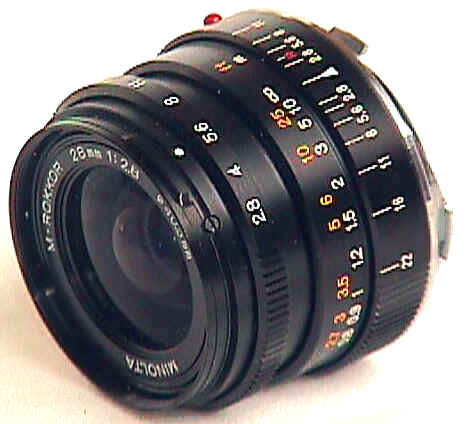 ALL of the various Cosina Voigtlander Leica mount lenses 12mm to 90mm will work on the CLE, with TTL metering. Add the Leica screw mount to bayonet adapter to the screw mount lenses, though the 35/1.2 and 50/1.5 are really beyond the CLE's shorter RF wide open and close up. ALL of the various Konica Hexar M lenses will work fine on the CLE and meter properly, with the exception of the 50/1.2 which needs a longer effective rangefinder baselength to focus accurately and consistently wide open and close up. Stop down to f/2 and beyond, and you will be fine. "Using Leica M-Lenses on the Minolta CLE"
135/4 Tele-Elmar-M no 28mm No 135 Frame. Focusing difficult. Size Comparison: left to right, 28/2.8 CLE Rokkor, 40/2 CLE Rokkor, 50/2 Summicron, 90/4 CLE Rokkor, 90/2.8 Tele-Elmarit. 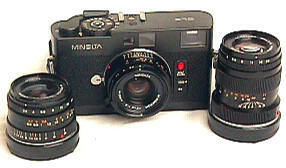 The CLE was Minolta's first camera with TTL flash, followed by the X-700. Many photogs don't realize the CLE and the much easier to find X-700 use the same TTL flash system. The CLE's original flash is the tiny, basic CLE. The larger more capable X-700 style PX flashes greatly increase your CLE's flash capabilities (including X-700 compatible flashes from other manufacturers). You can choose the 360PX, the 280PX, the 132 PX and the 80PX Macro. Other manufacturer's dedicated X-700 TTL flashes can also be used on the CLE. One user, Howard Cummer, reports great success with the Metz flash system. "The use of Metz flash adapter number SCA 331 lets a CLE owner use any of the 300 series Metz flash units with TTL flash control. I have been using a Metz 32CT3 and lately a 32CT4 with my CLEs for years, and use them both on camera and off camera (with the Metz adapter cord SCA 307A). I use bounce flash and sometimes a flash umbrella and the results are very good!" Be careful however, some off brands could short out the circuitry. IMPORTANT: Minolta Flash units have a built in safety switch which prevents shorting out the CLE's electronics if the flash is turned on before attaching it to the camera. Other manufacturer's flash units usually DO NOT have this safety device. They will probably short out the CLE's electronics if you turn on the flash BEFORE attaching it to the camera. I am also a fan of the dedicated Sunpak TTL flash units, including the Auto 30DX. It offers interchangeable TTL flash modules including Minolta, a rotating bounce flash, 3 auto ranges besides TTL, and manual choices of full, 1/2, 1/4, 1/8, and 1/16. Although about the same size as the Minolta 360PX flash, the Sunpak is much easier to use on the CLE as it does not partially block the shutter release as the 360PX does. REPLACEMENT Shades and Caps: After a quarter of a century or so, many of the original collapsible rubber lens shades have died or ran away, likewise for snap on front caps. After receiving about 10 zillion emails from people wanting to buy replacement shades and caps (which have not been available new from Minolta in many years), it finally occurred to me there might be a market for them. Da Ta Ta Dahhh. These are nicely finished 40.5mm metal screw in hoods, which just happen take the push on Voigtlander 50/1.5 front cap perfectly. These are not as compact as the originals, but I like personally them more. With the original shades you have to take the cap off and then spend a few seconds un-collapsing the collapsible rubber hood. With these, all you have to do is remove the cap and you are immediately ready to shoot. On the 40/2, these hoods intrude a very small amount into the lower right 40 frameline -- I would guestimate 5%. Before you ask, I don't think the coverage is wide enough to use on the 28/2.8 Rokkor. There is no shade intrusion into the 90 frameline at all. While a more narrow shade would be better for the 90, I have not yet been able to find a source for a quality, not too expensive metal 40.5 telephoto shade. The way I look at it, even a wide angle shade on the 90 is better than NO shade: it's your call if it will work for you. If you don't want to use the triple connector, you can also "daisy-chain" the units together with full TTL metering. For example, you could mount a 360PX on the camera's hot shoe, and use a Cable CD to connect it to another 360PX or 280PX. Or, you could mount your first 360PX remotely with an Off-Camera Shoe (which has its own accessory socket); connect a Cable OC from the camera's hot shoe to one accessory socket on the flash; a Cable CD from the other accessory socket to an accessory socket on the second flash; and so on, as far as you want. In principle there's no limit to how many units you can add, although results start getting unreliable once the TOTAL length of the cables starts getting much over 25 feet or so. Thanks to the fact that it used off-the-film metering for both ambient light and flash, the CLE was capable of some great flash tricks that would be very difficult, if not impossible, with almost any other camera. I'd set up my two 360PX units, joined by an "extra-long" Cable CD I had made by cutting off the ends of the Minolta cable and splicing in about 20 feet of four-conductor telephone cord. One of the units would go on a light stand, the other on the camera. First, though, I'd prepare the camera by putting a strip of masking tape in the flash shoe, so it covered the sync (center) and flash-ready (left) terminals, but NOT the TTL (right) terminal. When I saw exactly the peak action I wanted, I'd press the "test" button on the camera-mounted flash. Both flash units would fire; the TTL system would control them for correct flash exposure; and the sudden burst of light would terminate the ambient-light exposure immediately afterward! The result would be a long, liquid-looking blur terminated by a sharp flash image of the exact pose I had chosen. Slick, huh? No, you can't do this with "second-curtain sync" because you don't have exact control over WHEN the flash exposure is made. But with the CLE, it was a cinch! The rarest CLE is the Gold, made to commemorate Minolta's Three Millionth Camera! Only 300 were made. Serial numbers run from 3,000,001 to 3,000,0300. The body is all gold plated, including the strap lugs. The lens looks like a regular black 40/2 Rokkor, but its lens mount is gold plated. It came in a normal CLE box marked "Limited Edition." Anyone can gold plate a CLE, so beware of its value as a collectible if outside this serial number range. These cameras were sold BY LOTTERY ONLY to Japanese dealers. They were not exported, and are virtually unknown outside Japan. This information may be the first time it is published in English. Want more info? Read the CLE Test in the June of 1981 issue of Modern Photography or the Popular Photography test of September 1981 which includes internal construction. the CLE is a great choice. If you need the unique features of the CLE, there is simply no other choice. Side by Side: the CLE is 15mm shorter and 6 oz lighter than the M6. Both are the same height at the highest points. 1999 Update: Imagine an updated CLE: with AE lock, metered manual, motorized 2.5 fps film advance, 1/125th sync, 1/4000th top speed, improved RF/VF with 28,35,50,75,90,135 framelines, but no TTL flash. It's called the Konica Hexar RF. Strangely enough, the back focus on most Hexar RF's is within Leica M specs, but some are not. I know this thru personal experience. Roughly the same size as a Leica M6, the Hexar RF has the benefit of 10 years of technology and generally more features than the CLE in a not that much bigger package, including built in motordrive, 6 framelines, manual frame selector, metered manual, a top speed of 1/4000th, and a flash sync of 1/125. Yet it is not a clear-cut win, as the CLE has the Konica Hexar RF beat in terms of TTL flash, a slightly brighter finder, and what I feel is a better finder shutter speed display. The Hexar RF was discontinued by October 2003, after the Konica-Minolta merger. It remains to be seen if Konolta (or is it Monica?) will produce a successor. CLE PARTS: Where ART Thou?? The most serious CLE problem today is lack of repair parts, especially the circuit boards. Someone out there must have UNUSED CLE parts. I am looking for circuit boards, LED displays, finders, meters, etc. Revised: September 09, 2017 . Copyright � 1998-2003 Stephen Gandy. All rights reserved. This means you may NOT copy and re-use the text or the pictures in ANY other internet or printed publication of ANY kind. Information in this document is subject to change without notice. Other products and companies referred to herein are trademarks or registered trademarks of their respective companies or mark holders.